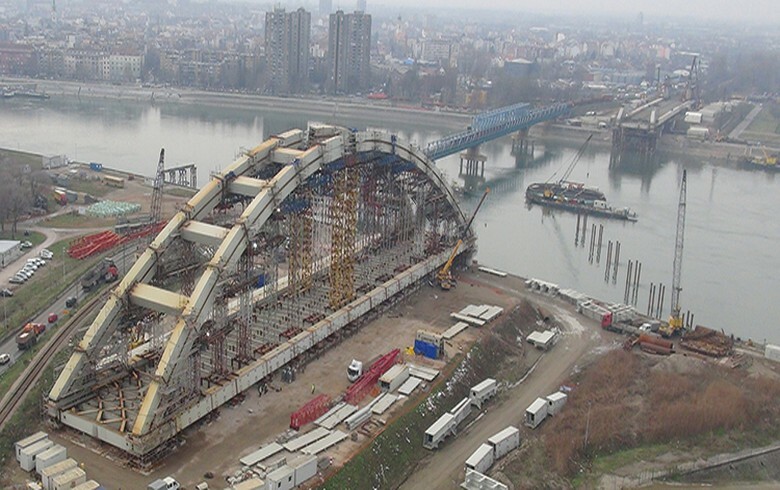 BELGRADE (Serbia), August 23 (SeeNews) – Serbia's government has said that Spanish civil engineering group Azvi plans to complete the construction of the Zezelj bridge across the Danube river on November 21. The traffic of vessels in the area will be suspended for three days, when the water level is appropriate, in order to install the last arch of the bridge, infrastructure minister Zorana Mihajlovic said in a statement on Tuesday. The European Union has invested 30.3 million euro ($35.7 million) in the construction of the bridge, plus 4.1 million euro for the building of access roads, while Novi Sad local government has provided financing of some 4 million euro so far, Mihajlovic said. The 474-m long bridge in Novi Sad, featuring two railway lines, two road lanes and two lanes designed for pedestrians and cyclists, would replace the one destroyed in a NATO air raid against Serbia in 1999. The Zezelj bridge is part of Pan-European Corridor X which will connect Salzburg in Austria to the Greek port of Thessaloniki, passing through Slovenia, Croatia, Serbia and Macedonia. In Serbia, the project includes the construction of the Belgrade bypass motorway, as well as two separate sections, linking Nis to Merdare and to the border with Bulgaria.